So you just heard about low carb lifestyle or the ketogenic diet and you want to transform your body and mind? 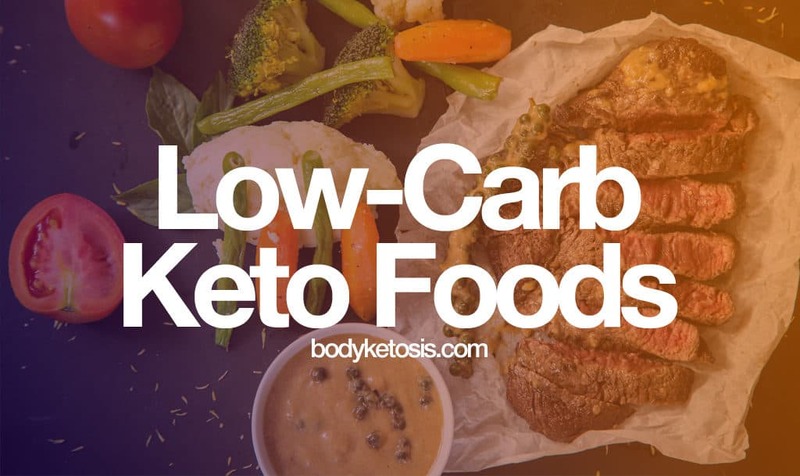 Wondering what low-carb foods you can eat during keto diet? Not sure if you can eat a banana or add stevia to your breakfast? Confused about which vegetables are low carb and keto friendly and which are not? Well, you are in the right place. In this article, you will get answers to all of this questions and we have included a printable keto grocery list which you can take with to shopping. Following a diet is never an easy, especially when you are just starting out. This is why we have compiled together this mammoth size keto food list in EAT THIS NOT THAT style so you can rock your fat loss journey. Oh, and the added cherry on top is our printable keto grocery list - be sure to take it with you. Download our FREE printable keto grocery list, and never be confused again. Take this list with you next time you are going grocery shopping! Please check your email! Your grocery list is on it's way. The low carb or keto friendly foods, in general, are not rocket science. You can get them from almost any grocery store nearby. In general, focus on eating quality, minimally processed real food. Ideally, the food you buy shouldn’t even have a list of ingredients or should be as short as possible. Keto foods, in a nutshell, are fats and oils from natural sources, organic and grass-fed protein sources (if possible), above the ground vegetables and leafy greens, full-fat dairy products, nuts and seeds and stevia-based flavorings. Now, let’s dive deep into each of them separately. You can add fats to your meals, sauces, make them into fat bombs or eat them as a keto snack. Remember that fat doesn’t directly make you “fat”, excess calories make you “fat”. Don’t be scared of them. Fats are essential nutrients for our bodies: a source of energy, used as stored energy, contain essential fatty acids and much more. You are probably well-aware that there are many different types of fats when it comes to fatty foods. There are fats that are good for you and there are fats that aren’t so good for your body. Some are more beneficial than others. Here is a quick overview of types of fats out there. Saturated Fats. The good type of fats. Saturated fats are found in red meat, cheese, dairy, ghee, lard, eggs, coconut or palm oil and also MCT’s. They are the most stable and have high smoke points. Use these oils for the most of your cooking. Monosaturated Fats. Also the second good type of fats. Monosaturated fats are found in avocados, olives, nuts, and beef. Oils high in monosaturated fats are ideal for cold use. Most of our fat Intake during keto diet should come from saturated and monosaturated fats. Polyunsaturated Fats. Naturally occurring polyunsaturated fats are good (like found in meat and fish). But, processed polyunsaturated fats are bad for you. In general, polyunsaturated fats are unstable and not suitable for high-heat cooking. Polyunsaturated fats include omega 3 and omega 6 fats which are essential fatty acids that your body needs for brain function and cell growth. Trans Fats. Considered by many doctors to be the worst type of fat you can eat. Trans fats will raise your LDL (bad) cholesterol and lower your HDL (good) cholesterol. Avoid these, they are harmful to your body. Trans fats are also often linked to heart diseases. Both omega 3 and omega 6 are essential fatty acids that the body needs for brain function and cell growth. Polyunsaturated fats can lower your LDL (bad) cholesterol. Our bodies don’t make essential fatty acids, so you can only get them through food or supplements. The problem is that studies have shown that Western diets are often deficient in omega 3 fatty acids. The balance is often very unfavorable (16:1), where ideally it should be 1:1. This is why you need to balance between your omega 3’s and omega 6’s. You probably already are getting enough omega 6 through food, focus on increasing your Intake of omega 3. Eating things like salmon, tuna and trout will help you keep the Omega 3’s balanced. If you don’t like fish then alternatively you can take omega 3 supplements. Always prefer organic and grass-fed fat sources if possible. When choosing vegetable oils, choose the “cold pressed” options. If you love high fried foods, then choose beef tallow, ghee or coconut oil. They withstand higher temperatures. The keto diet is a high-fat, moderate-protein and low-carb diet. But this does not mean that you cannot eat any carbohydrates at all. When on a keto diet, you are going to juggle with vegetables and fruits as far as carbohydrates go. Vegetables are an important part of any diet (low carb or not). But the problem is that not everyone knows which vegetables are more keto-friendly and which of the one should avoid completely when doing a ketogenic diet. The best right type of vegetables has high nutritional value and most of the time is dark color or leafy. The rule of thumb as far as vegetables go is to eat vegetables which are grown above the ground and are leafy greens – for example spinach and lettuce. And as always, if possible prefer organic vegetables. What about vegetables that grow below the ground? Are they off limits? Well, it really depends, but there are veggies that you can consume which are grown below the ground, but consume them in moderation, as the carbs will add up very quickly. Often the best way to consume the ground veggies is to use them to add flavor to your food (e.g. onions). As a conclusion, there is no one size fits all rule, you just need to keep looking for the vegetables with the lowest net carbs and count your macros. Probably one of the most popular questions for any newbie ketoer: can you eat fruits when doing the ketogenic diet? Well, in short, try to avoid it as much as possible. If needed, eat berries, but also in moderation. Bear in mind, that fruits are candy from nature and they are full of sugar. For anyone starting out with the keto diet, fruit is often a big confusion point. Fruit is healthy in general, but it also contains usually a lot of carbs, which does not fit into our ketogenic regimen. In most cases, one piece of fruit would take up the majority of your daily carbohydrate intake. Can I eat a banana while on a keto diet? The answer is no. As a rule of thumb, keto friendly vegetables are the ones which grow above the ground and often are leafy. Vegetables growing below the ground contain more carbs, so you need to be more careful (especially starchy vegetables). As a second rule of thumb, avoid medium, large sized and exotic fruits. They usually contain way more sugars than other fruits. Protein sources are the second important part of your ketogenic diet menu. Proteins are essential nutrients (unlike carbohydrates) for the human body. They are one of the building blocks of body tissue and can be used as a fuel source if needed. Fats and protein are the most vital macronutrients and without them, we couldn’t survive. In this section, we go over all the protein sources for the keto diet. The main takeaway section is that when you are on the keto diet you need to be aware of your protein intake. Too much protein on a keto diet can lead your body to lower levels of ketone production and increased production of glucose. There is a misconception, that "the ketogenic diet is a high-protein diet“. This is wrong, this is a myth. The ketogenic diet is a high-fat, moderate-protein and low-carbohydrate diet. Moderate-protein, because too much protein will kick you out of ketosis and too little protein will cause muscle loss. When choosing meat then it’s ideal if you can get grass-fed meant, because of its more favorable fat profile and micronutrients. If you cannot get for any reason grass-fed meat then the grain-fed meat will do the thing as well. As far as poultry goes, know that the more protein meat contains, the less you generally want to eat it. That is because the more protein meat contains, generally the less fat it contains as well. Keep in mind, that calories will add up very quickly. Eating fish during your keto diet (or any other time) is a good way to get enough protein and it is a good source of omega 3 fats as well. If possible, we suggest preferring anything caught in the wild like salmon, tuna, trout and so on. The fattier the fish the better. Always choose the fattiest meats aswell the most fattier parts of the meat and fish. The higher amount the protein in the food, the less you want to consume it. Balance your protein intake with side dishes, cheese, and sauces. Dairy is probably one of the good reasons why keto diet is so enjoyable – e.g. you can enjoy full-fat yogurt, real cream, and cheese together with your meals. But not all dairy is created equal. Keep an eye out for filled carbs, digestion issues and sometimes higher levels of protein. Okay, but what should I do when I am lactose intolerant? No worries, we got you covered. Like we all know, lactose is a sugar found in milk and that is also one of the ingredients that are often harder to digest. Symptoms include gas, bloating, diarrhea and potential nausea. If you are lactose intolerant, prefer hard and long-aged dairy products. They are much lower in lactose and should be easier for your stomach. The second idea would be to use ghee. Ghee is an ideal alternative for anyone with a sensitive stomach. Just swap ghee for butter. If the previous ideas don’t work then consider excluding dairy from your menu. You do not need dairy for the keto diet to work and to lose fat. The best alternatives for this move would be coconut and nut alternatives. Always go for the organic, raw, full-fat dairy options if possible. Ignore low-fat or fat-free dairy products. More than often 1-2% dairy products are filled with carbs. If you are sensitive to lactose, choose long-aged dairy products (usually they contain much less lactose). Nuts and seeds are the perfect keto diet companion. They are high in fat, easy to eat but they are not completely carb-free so you should be eating them in moderate amounts. They are also often high in protein, so like with protein sources in general, it can and will add up quickly. Nuts and seeds are perfect to add texture and flavoring to your keto meals. Keep in mind that snacking, in general, can lead to slower weight loss because it increases insulin levels. Sometimes couple of snacks (like protein bars) will become cheat meals or even days. So be aware. Nuts and seeds are lower in carbs than many fruits and vegetables, and they are also rich in fiber which you lack anyway while on the keto diet. If you like to coat or fry your food, then a good alternative to flour is almond flour. Nuts are the perfect keto snack. But beware of the carbs, as they will add up quickly. Condiments and sauces, herbs and spices are a vital part of any diet, as people use them on a regular basis to add some flavor and to spice up their meals. Condiments and sauces, but also herbs are in the gray area when it comes to ketogenic diet. On the one hand, they aren’t the primary source of fat or protein, but they do contain carbs. On the one hand, you probably use them so little, but if you add too many spices or too much sauce, the carbs and calories will add up very quickly. Let’s start out with the fact that herbs and spices do have carbs in them, so keep that in mind when counting your macros. Spices are not the safest route to go because, for example, most pre-packed spices have added sugar in them. This is why you should always double check the nutrition label. Also, always prefer sea salt over table salt if possible, as it is sometimes mixed with powdered dextrose, bummer right? So, what’s the takeaway? Do I need to start counting every gram of herbs and spices? I would go crazy. No, you don’t need to count everything. Typically, the number of carbs in spices are minimal, so you don’t have to drive yourself crazy with them. But, when you love to use a LOT of spices when cooking, then you should try to keep track of them as the carbs will add up quickly. Prefer sea salt over table salt. Most pre-made spices contain added sugar, so check the nutrition label. Salt and pepper can be used for seasoning without worrying about the nutrition labels. Let me guess, you have a sweet tooth? You also have been fighting the sugar cravings in the past and are wondering how to overcome that with keto diet? You are in the right place! This is probably one of the most popular topics when it comes to keto foods. For low carbers and ketoers, the sweeteners (sugar substitutes) often mean the difference between giving up and going over the daily carb limit or safely satisfying the sweet tooth. The problem is that many sweeteners (mostly powder based) contain sugar based fillers. This is why when choosing a sweetener, we suggest you go for the ones in the liquid form, as they usually do not contain added binders. But are sweeteners keto-friendly? Can I eat sweeteners when on a keto diet? The best feedback I could give is that the best way to lose fat and stay in ketosis is to stay away from anything sweet tasting. But if you cannot live without it, then no worries, we got you covered. The key is to choose natural sweeteners that will not damage your body. How to choose a sweetener? Sweeteners can be divided roughly into three bigger groups: natural sweeteners which come from purely natural sources, sugar alcohols which are also natural but consists of slightly higher carbs and artificial sweeteners which are synthetic but may be derived from naturally occurring substance, including herbs or sugar itself. For the keto diet, we suggest choosing natural sweeteners, as they are natural, contain no calories and are hundreds of times sweeter than sugar. When looking for a sweetener, the first important argument is the low glycemic index (GI). Low glycemic index (GI) refers to how much a product raises blood sugar. The scale is from zero to 100, zero represents no rise in blood sugar. As the goals with a keto diet, is to stay in ketosis, always choose a sweetener with a glycemic index as close to zero as possible. The second obvious but important factor to consider is if the sweetener is sugar-free and low carb? This may be self-explanatory but as we are following the low carb diet, it’s vital to keep the sugar and carb content to as low as possible. Sweeteners produced by nature without any added chemicals or fancy machinery. They include wild, non-hydridized, seeded fruits and natural sugars, starches from vegetables, seeds, nuts, and roots. Examples of natural sweeteners are maple syrup, honey, and xylitol. Stevia comes from the extract of the herb Stevia rebaudiana. Stevia contains no calories, no carbs and it has zero glycemic indexes. What makes it more perfect is that it is 300 times sweeter than table sugar. This means you don’t need to use it a lot to get enough sweet taste. Stevia comes in many forms but is most commonly used in a liquid form, called as stevia drops. When you are buying stevia, especially the powdered versions, always verify that there are no filler ingredients. Many commercial sweeteners have added fillers like maltodextrin, dextrose or even artificial sweeteners. From a negative side, some people have stated that the aftertaste can be peculiar if used in large amounts. Quick fix for this would be to use it sparingly. Inulin is derived from chicory root and has a naturally very similar taste to sugar. It can be caramelized like sugar and it has almost no aftertaste. Unlike sugar alcohols, inulin doesn’t have a cooling effect and should not cause any digestive issues (assuming the recommended amount is not exceeded). Inulin has a beneficial effect on blood sugar and is one of the best sugar alternatives for anyone following low carb diets. Unlike stevia, 100g of inulin is about 150 kcal and contains 37g of net carbs. When it comes to side effects, then the daily suggested dose is 20 grams, if overused can cause digestive issues. Sweetener often found in dairy products. Tagatose is very similar in texture to table sugar and is 92% as sweet, but 38% the calories. Since it is metabolized differently from sucrose, it has minimal effect on glucose and insulin levels. It is also approved as a tooth-friendly ingredient for dental products. Tagatose has a glycemic index of 3 which means it has a small effect on blood sugar levels and can be used with other sweeteners. The availability of tagatose can be limited, especially compared to stevia. This sweetener is made naturally from the antioxidants in the fruit. It is a low-calorie sweetener. The glycemic index of monk fruit is zero. Like stevia and erythritol, monk fruit has a zero glycemic index. It is also 300 times sweeter than sugar. The taste is similar to stevia but without the aftertaste. The main downside of monk fruit is that it is more costly than stevia or erythritol and isn’t as widely available. Sugar alcohol has been a popular alternative to sugar for decades. They mostly look and taste like sugar but without the negative health effects. Sugar alcohols are actually types of sweet carbohydrates found naturally or processed from other sugars. Despite the word "alcohol" in the name, sugar alcohol does not contain any ethanol. The main problem with sugar alcohols is that they can cause digestive problems, especially when consumed in large amounts. The reason is that your body cannot digest most of them, so they will be metabolized by the gut bacteria. Some side effects can be like gas, bloating or diarrhea. Erythritol is a powdery sweetener which is categorized as a sugar alcohol. It is naturally found in many foods, mostly in fruits and vegetables. Like stevia, erythritol has a glycemic index of zero and is pretty low in calories (about 0.24 calories per gram). It is not quite sweet as sugar, so you would need to use it a little bit more to get a stronger taste. One downside of sugar alcohols is that they can cause digestive issues like bloating. When choosing erythritol, then as always, verify that the product doesn’t contain additivities that can spike your blood sugar. Erythritol occurs naturally in plants like grapes, melons, and mushrooms. The commercial sweetener is usually made from fermented corn or cornstarch. Xylitol has a similar consistency and taste to sugar, but has third fewer calories and is a good alternative. It has the same level of sweetness as sugar but is a sugar alcohol, which means it can cause some digestive issues. Xylitol is found in fruits and vegetables. Xylitol is mainly used as a sugar in chewing gums. Daily consumption of more than 25g may cause diarrhea. An important note is that only 50% of xylitol is absorbed in your small intestine, other 50% is not absorbed but instead fermented by bacteria in your colon which may cause digestive issues. The downside of xylitol is, that it is low carb but not zero carb. Xylitol has a glycemic index of 13 and contains 2.5 calories per gram. Maltitol is a sugar alcohol and it has up to 90% of the sweetness of table sugar (sucrose). It is commonly used as a sugar replacement, because it is half as caloric, does not promote tooth decay, and also has a somewhat lesser effect on blood glucose. Usually, products that are labeled as sugar-free, contain maltitol. Maltitol has a glycemic index of 36, which means it has a big impact on blood sugar. As you are following a low carb diet, then we would suggest you keep away from this. Maltitol has also potential side effects like bloating, diarrhea and abdominal pain. Also called sugar substitutes are alternative sweeteners. Substances used to replace sugar in foods and beverages. They can be divided into two large categories: nutritive sweeteners which have energy value in calories, and non-nutritive sweeteners which are a high-intensity sweetener because they add no energy value to the food. Aspartame Is probably the most well-known sweetener of artificial sweeteners out there. It is commonly used in soft drinks. It’s 200 times sweeter than sugar, has zero calories. There’s a body of research saying that aspartame is safe. Some experts are saying that consuming aspartame can result in headaches, dizziness, chest pain, nausea, depression and so on. Aspartame has a zero glycemic index. Interestingly enough aspartate is unstable at high temperatures, so it shouldn't be used for baking or cooking. Sucralose is an artificial sweetener which is marketed under the name of Splenda. Sucralose is a relatively new sweetener on the market. The taste of sucralose is very similar to sugar and it is 600 times sweeter than white sugar. Sucralose is good for baking and cooking because it maintains its sweetness at high temperatures. There is not enough research done on the safety of sucralose for the human body. Sucralose itself is generally calorie-free, but Splenda (sucralose based product) contains carbs (dextrose and maltodextrin) and brings calories up to 3.36 cal per gram. Similar to aspartame, people have reported bloating, cramping and rashes. Prefer natural sweeteners if possible. Prefer sweeteners in liquid form. Choose sweetener with the glycemic index as close to zero as possible. Probably the biggest aspect of anxiety is how to deal with potential cravings (and they will come). Most of the time, cravings come in the form of sugar. And this is totally understandable, as most of you (me included) haven't ever been entirely sugar-free and this is hard. Not all the cravings are the same. Some people crave crunchy and salty foods like chips, crackers, and popcorn. Some people crave fatty foods like pizza, french fries or cheese. Before we can deal with cravings, we should understand why we are getting cravings. This is the key. Most of the time, your cravings are mental, meaning they are not real. They often occur because of habit, stress or boredom. You are not going to die if you resist the urge for crunchy or sweet snacks. It just takes time to reprogram your mind and build new, healthier habits. Hidden carbs truly are everywhere, sometimes innocent sometimes not. One big false belief is that as long as you cook your own meals and avoid the processed food you will automatically avoid all the hidden carbs. This is not true. Hidden carbs lurk in through healthy food options like sugar-free products. This is why especially when following the ket diet, you should try to avoid all the sugar-free products. You probably already know to avoid sweet sauces, but what about other flavorings? Most of them can and will add up your calorie intake, so keep a straight eye on them. For example, one tablespoon of garlic powder contains 6g of carbs, paprika 3.3 grams, and chili powder 4.1 grams of carbs. All dairy products contain some amount of carbs. When you are on a keto diet, always prefer full-fat dairy products, as they are the best for the fat and low carb content. Always avoid low-fat or non-fat varieties as they are not on the keto diet because the number of carbs is bigger when the fat is lowered. Always choose cream, whole or full fat. Everyone loves snacks, and many keto beginners have built up their diet upon keto or sugar-free snacks, which they often feel can be eaten guilt-free. This is definitely not the case. Popular drinks and snacks are the worst offenders. Always check the nutrition label. Most fruits are best avoided during the keto diet. This is because the only handful of them are low carb and can be eaten during a keto diet. For example raspberries, blackberries and strawberries. At the same time bananas (net carbs 25g), apples (net carbs 18g) and grapes (net carbs 15g) are totally off the table. Although half-cup serving might not seem too bad, that's really only about a handful, of what most people eat during one sitting. This is another misleading label on products. Marketers are betting on you to read this as no sugar, but this is not the case. Products labeled no sugar added, are usually naturally sweet foods like fruit juice and raisins. And the label says there is no sugar added, but the product itself contains already sugars. These foods are naturally high in carbs. Not adding the extra sugar, may be a better choice for the average consumer, but when you are on the keto diet this is a big nono. This is another big one. This is one step further to the dark side of food manufacturing. If a product is labeled low carb or sugar-free, it does not mean that it is good for you. Different manufacturers often label sugar alcohols as zero carbs, which they always are not. When trying low-carb or sugar-free products, do your research and make sure that you are not getting hidden carbs. By now, we have covered the main foods what you should eat during the ketogenic diet. As the list has been comprehensive – everyone should be able to pick something acceptable for them. As during life is not always so black and white as described above, sometimes we encounter in situations where we are not sure if one or another food is suitable for keto or not. The reason why you should very precisely follow what you eat is that this will make or break your ketosis journey – as eating more carbs than supposed to will bring you out of ketosis very quickly and slow down your body’s fat burning capabilities. Now I will go through a list of foods that you should avoid at any cost. Avoid any kind of products labeled “low-fat, low-carb, zero-carb” or similar. These products are often high carbs or contain artificial additives. Also, keep in mind that some sugar-free chewing gums can include carbs. Foods containing artificial ingredients like artificial sweeteners (sucralose, aspartame, etc. ), dyes and flavors. Sugar is essentially sweet, soluble carbohydrate – which is found everywhere, and in the context of the ketogenic diet, none of them are suitable. Different grains can have a different impact on diets. Whole grain foods are often considered as a healthy choice – which they definitely are in some other menu but there’s no room for grains in keto diet. Slice of bread can have anywhere from 10-30 grams of carbs which can be already our daily limit. Avoid wheat, oats, all rice (white, brown, jasmine), quinoa, couscous, pilaf, etc. Corn and all products containing corn, including popcorn, tortillas, grits, polenta, and cornmeal. All types of products made with flour, including bread, bagels, rolls, muffins, pasta, crackers, chips, pretzels, Oatmeal and cereals, granola bars, most protein bars or meal replacements, etc. Beans are a good nutrition source for anyone following a regular diet. Unfortunately, they don't fit into ketogenic lifestyle thanks to their high starch (carb) content. Avoid legumes including kidney beans, chickpeas, lentils, black-eyed peas, pinto beans and so on. This is often a deal breaker. As people, often are not willing to sacrifice sweet drinks and alcohol. Some drinks can consist even more carbs than foods, that’s why you should avoid fruit juices and yes even 100% fresh juices and smoothies. The second part of this equation is alcohol – which can play a big role in your diet. Alcohol will slow down your fat burning process and can kick you out of ketosis. Also, many alcoholic drinks have often hidden carbs, so try to ignore beers, cocktails, flavored syrups, sodas, sweet wines and flavored liquors. Addition to alcohol, avoid sweetened teas and coffee drinks and most coffee creamers. If you need one then prefer keto friendly coffee creamers. One of the biggest reasons why my first attempts of ketogenic diet failed was that I was still eating fruits during keto diet – banana was supposed to be healthy right? Although they are healthy they often include a lot of sugar – why do you think they taste so sweet? Fruits are high in sugar and carbs. That includes tropical fruits, fruit juices, dried fruits and also the fruit smoothies. Avoid dragon fruit, peach, nectarine, kiwi, grapefruit, apple, orange, plums, cherries, pears, pineapple, mango, banana, papaya, fruit smoothies, fruit syrups, fruit concentrates. This also includes dried fruit like dates and raisins. Following a diet is never an easy job, especially when you are just starting out. There are already a lot of stress and questions involved, why need to complicate things even more. The choice of right foods is vital when it comes to the success of keto diet and fat loss. This means eating the right foods but also putting the focus on the food quality. Preferring raw and organic food sources if possible. In order to receieve all the benefits what keto diet can offer you, you would need to eat the right things the right way. For that, it's vital to remember everything you need. Exactly for that purpose, we created a convenient keto diet grocery list, which you can print out and take with you to your next shopping trip. By now we have gone through most of the good and bad when it comes to foods you can and should eat, but also foods you should avoid during the keto diet. Keep in mind that all the foods can vary between individuals – some endure dairy some don’t. Key takeaways from this article would be: eat real foods and healthy fats, avoid processed foods and any kind of sugar. Oh, and whatever you do, do not eat more than 20 grams of carbs per day.